This 5 DVD set includes five complete Western serials! 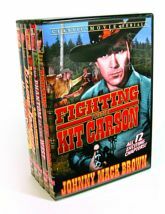 Fighting with Kit Carson: Kit Carson is the sole survivor of his calvary brigade after they are murderously attacked by the fanatic "Mystery Riders." Starring Johnny Mack Brown. Flaming Frontiers: Tex Houston heroically fights for the land rights of besieged ranchers in fifteen thrilling episodes.- Starring Johnny Mack Brown. Phantom of the West: The League of Lawless harbors a deadly criminal known only as the "Phantom." Starring William Desmond, Tom Tyler, and Kermit Maynard.